This trail is suitable for novices and family groups. Based on open forest roads and contouring the hillsides, it takes in the magnificent waterfalls on the Gain and Mawddach rivers and also and visits the old Gwynfynydd Gold mine, the last source of Welsh gold. There are a couple of downhill sections on forest roads, so younger riders will need to be able to control their speed. The MinorTaur has quickly become the most popular trail at Coed y Brenin. It’s a great fun introduction to mountain biking for a wide range of ages and abilities and is unique, in that it is usable by riders with a disability on adaptive mountain bikes. The trail is built in 3 loops, which get progressively longer, so you can choose the distance you want to cover. There are plenty of fun features, including stone steps, tabletops and fantastic swoopy berms. Remember to treat with caution on your first ride, perhaps going back over the different sections to improve your skills. Also, remember to look out for the shiny hoof prints which give you a clue that there’s a MinorTaur about! The long awaited extension to the popular MinorTaur Trail at Coed y Brenin will open on Saturday 16th March 2019. The MinorTaur Trail has long been a hit with rider. 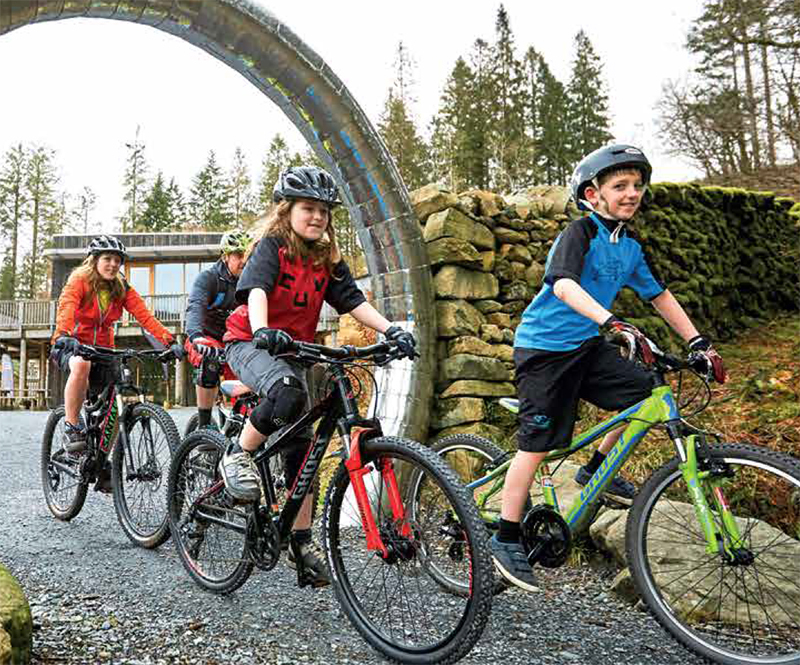 This blue graded trail provides many peoples first experience of Coed y Brenin, offering young riders, families and newcomers an exciting and approachable way to experience the thrill of mountain biking while taking in some of the spectacular scenery that the Forest Park has to offer. The original MinorTaur route was broken into 3 loop sections that could be ridden individually or together to make one single ride of 9km. The new section allows riders to extends the trail a further 3km to 12km in total. The new loop adds some exciting newly built sections of singletrack trail to existing forest track from the Yr Afon trail to take in the spectacular Waterfalls, disused Gold Mine and Gunpowder works before returning via another new singletrack section, then along the original MinorTaur return route up the valley floor to the Visitor Centre. The MinorTaur trail has successfully introduced many thousands of people to mountain biking and given them a taste of the adventure it offers. The trail features no steep grades or rocky sections that might knock the confidence of riders as they develop their skills, instead they can appreciate smooth rolling on riverside singletrack, immersed in one of the most beautiful forests in North Wales. The trails 4 loops progressively add features, introducing riders to new challenges as they further their distance. You can expect to find stone steps, rollers and table-tops, berms and even the occasional (optional) jump. The new sections of loop 4 adds some rougher private track with a steeper, looser climb that some may wish to push but after this there is the reward of a good forest road descent. A short route, giving riders a taste of what to expect from the more advanced riding in Coed y Brenin. It includes 5 sections of great singletrack, from extremely technical rock pitching, to fast flowing swooping curves through the trees, one main climb, up from the river Gain and over to the excellent Beginning of the End section of singletrack; a fun Friday afternoon prelude to a weekend’s riding in the forest. A combination of the Dragon’s Back and MBr routes, the Beast of Brenin is a challenging but very rewarding route, which has a perfect balance of fast open riding and technical twisting descents. Stop at the Heron Forest Café for tea and cake (opening hours vary) before heading out onto Moel Hafod Owen for spectacular views of Snowdonia. Mountain Biking is not without it’s risks but you can take good care of yourself and others if you follow the advice in Natural Resource Wales’ Forest Cycle Code. Consider wearing other protective clothing. Take the time before riding a trail to check out the trail head grading information. For longer rides you’ll need food and water. What about your fitness & stamina? Think about the weather. Do you know the forecast? Bear in mind that the weather at the trailhead might be fine, but further up the hill, it could be colder. 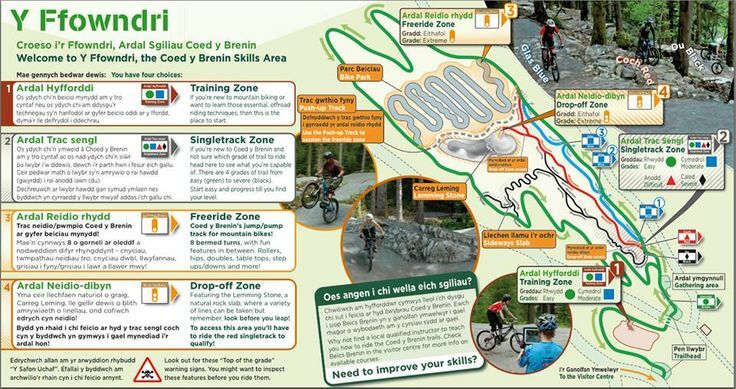 Coed y Brenin’s extensive trail network contains a variety of trails to suit all abilities. Take a look at this handy grading guide, which will help you get started on the right level of trail for your skill and experience level. This is what MBr wrote when they visited a while back. Note that this was before the addition of the MinorTaur blue grade route.